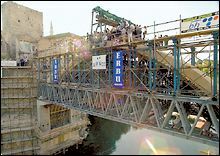 POSTWAR RECONSTRUCTION: The first phase in rebuilding the old bridge in Mostar - a city south of Sarajevo that once symbolized Balkan unity - was finished in August. It will eventually reconnect Muslim and Croat residents. SARAJEVO, BOSNIA-HERZEGOVINA – As Paul Bremer and his team of administrators are now learning in Iraq, building a pluralistic democracy from scratch is a daunting proposition. It's even more challenging when resources and patience are limited - and ethnic and religious differences unlimited. In Bosnia-Herzegovina, Paddy Ashdown, the international High Representative there, knows this all too well. By now, the Balkan state, long-aborning, should have had a single customs service - along with one army and one intelligence service. Instead, despite years of international unification efforts, there are still two of each, one in the Sarajevo-headquartered Muslim-Croat Federation, the other in the Republika Srpska, the Bosnian Serb entity next door. The customs merger has been approved, but foot-dragging by nationalist elements has prevented its implementation. Meanwhile, long-discussed centralizations of military command and spy services, crucial to reducing hostility and mistrust in this fractured land, are still no more than topics of international commissions. Hobbled by the Dayton Peace Accord of 1995, which confirmed the existence of a country of Bosnia and Herzegovina but also allowed it to be split into the two ethnic "entities," Mr. Ashdown is like a conductor directing two competing orchestras at once. An Englishman serving his second year as the fourth international High Representative, Ashdown is under increasing pressure either to show results or to give up, and let Bosnians (the common shorthand for all residents of the state) fend for themselves. Peacekeeping troop strength is down to 12,000 (1,800 of them Americans, all National Guard) from a high of 60,000 after the war. And having spent $17 billion here already, the international community has been dramatically downscaling its physical presence and cash outlays. The UN has largely withdrawn. Ashdown's own mandate ends next May, and no one can say whether his stint will be extended, or if another High Representative will replace him. As crunch time approaches, a public debate has arisen over this question: Can - or should - any foreigner try to 'make' a country? The European Stability Initiative, an influential think tank based in Germany, has called on Ashdown to head home soon, warning that his authority "reinforces the passivity of Bosnian politicians... Bosnia's governments will perform better ...once they become clearly accountable not to you but to the elected representatives of the Bosnian people." But a wide range of observers agree that Bosnian elected officials are hardly ready for prime time. "There's no link between politicians and the electorate," says European Commission spokesman Frane Maroevic. "They don't have to deliver any economic progress." Today's GDP is half that of 1991, and officially, unemployment is at 40 percent. With government officials largely occupied with political maneuvering and patronage, concrete change has largely been the province of the legion of foreigners working for NGOs, NATO-led peacekeeping forces, the European Union, and Ashdown's Office of the High Representative (OHR). A charismatic salesman, Ashdown peddles his plan for the coherent structures and centralized institutions crucial to a functioning market-based democracy with the slogan "Jobs and Justice." He's pushed through a massive reevaluation of government staffers in an effort to end endemic graft and patronage. He's backed a cleansing of the judiciary in hopes of undergirding the rule of law. And he convened a so-called Bulldozer Committee of businesspeople that eliminated 50 key bureaucratic and legal obstructions to transparency and initiative. "Ashdown's greatest triumph is enlisting hope in the future," says Mark Wheeler, country director for the International Crisis Group, a Brussels-based NGO. "People expect more of Paddy than of their own political structures." Small wonder. For a country of under 4 million, Bosnia has a dizzying number of political parties and levels of government bureaucracies, and a paucity of meaningful paths or options. Doctors, teachers, even police, are on strike. Young people, sitting dead-eyed in sidewalk cafes, dream of a future abroad. Ordinary Bosnians say they see no improvement in their circumstances, though domestic mafia figures seem to grow ever richer. Half of the dispirited population didn't even vote in the last election. That contest brought victory to an improbable alliance of nationalist parties - the very Serb, Muslim, and Croat parties whose extreme views ignited the war in the first place. Now each faction fights for its share of the spoils. The ethnic Serb nationalist party, the SDS, for example, has blocked the joint customs service, which would have had the effect of clamping down on a black-market economy said to be dominated by key SDS backers. Most troublingly, nearly eight years after the end of a war between ethnic Serbs, Croats and Bosnian Muslims - in which a quarter of a million died and millions more were displaced from their homes - the core dispute remains unresolved. "It's a ceasefire, nothing more," says one ordinary Bosnian. "There won't be war, but there will be no real peace." The fissure was confirmed in August, when a poll of Republika Srpska residents found two-thirds amenable to the idea of ditching Bosnia altogether to join neighboring Serbia and Montenegro - up from one-third in a previous study. Still, there are signs of progress here. Some nationalists have proved surprisingly open to Ashdown's initiatives, acknowledging that only by stabilizing the domestic situation can they gain admission to the European Community and attendant economic benefits. The massive foreign-funded rebuilding throughout the country is cause for buoyed spirits. And Bosnia, a country with almost universal literacy, is beginning to replace a generation of talented young workers and intellectuals who died or fled. To many, this is not yet the right moment for sink-or-swim. "We think another couple of years of intrusive tutelage is necessary," says ICG's Wheeler. He pauses for just a second. "The dilemma is, the deeper you get in, the harder it is to get out."